The control room at Outpost Digital, featuring a newly installed Genelec 5.1 monitoring system consisting of five 8240A Bi-Amplified Active Monitors for the L-C-R and rear surround arrays, and a 7270A Active Subwoofer. NATICK, MA, November 14, 2012 — Genelec, the world’s longstanding pioneer in active monitoring, is pleased to announce that Outpost Digital, the leading New York City audio and video post production company whose clients include Dodge, Champion, ESPN, Cingular, IKEA and others, recently upgraded their audio system with the installation of three new 5.1 surround monitoring systems from Genelec. 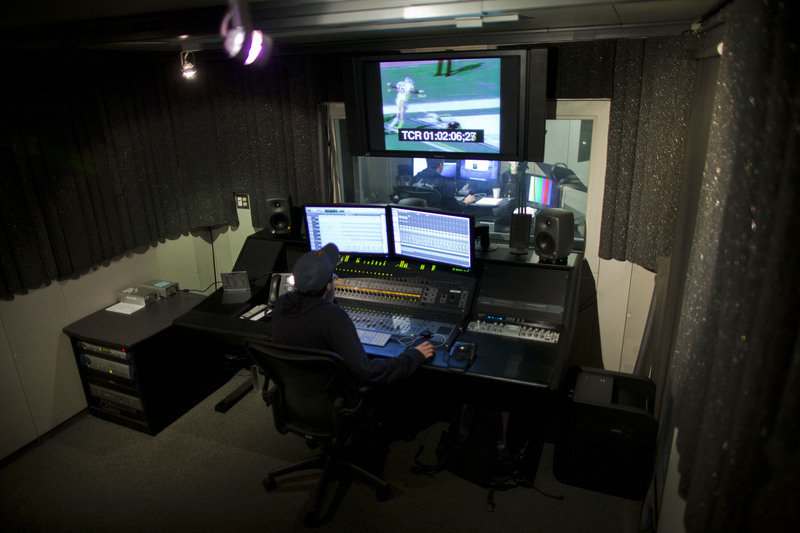 In the wake of an expansion last year that saw 13 new post suites added to the company’s existing facility, Outpost Digital’s two main coloring and mastering studios each now have a newly installed Genelec 5.1 monitoring system consisting of five 8240A Bi-Amplified Active Monitors for the L-C-R and rear surround arrays, and a 7270A Active Subwoofer. The facility’s Pro Tools editing suite is now equipped with a Genelec SE™ (Small Environment) Smart Active Monitor™ (SAM) System - aka Digital PowerPak - a 5.1 system using five 8130A Bi-Amplified Active Monitors and an SE7261A Active Subwoofer. All of these new Genelec monitoring systems employ the company’s proprietary Smart Active Monitor (SAM) concept that includes GLM™ (Genelec Loudspeaker Manager software) and AutoCal™ (Automated Calibration software) technologies, which together create a self-calibrating monitoring solution that both guarantees accurate audio and ensures a steady-paced workflow. These products and technologies reflect Genelec’s recently introduced SAM concept, which allows monitors to be controlled with digital networking to enable the building of highly flexible computer-controlled systems of monitors. The Genelec system was sold to Outpost Digital by Audio Incorporated, of Roselle Park, NJ. Photo Caption: The control room at Outpost Digital, featuring a newly installed Genelec 5.1 monitoring system consisting of five 8240A Bi-Amplified Active Monitors for the L-C-R and rear surround arrays, and a 7270A Active Subwoofer.